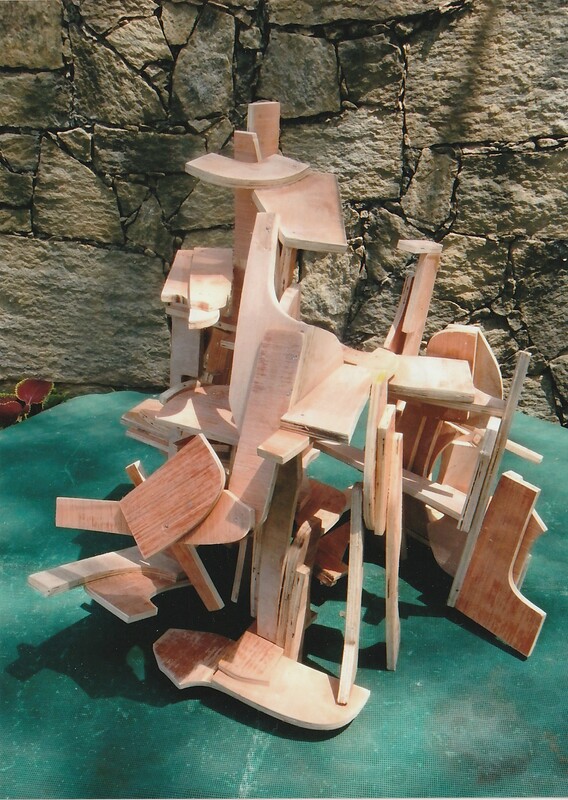 I would surmise that there are still outstanding unresolved areas towards the achievement of a wholly satisfactory and integrated new sculpture, which attempt to emulate past values in new form by adding to them, that require much creative effort by today’s sculptors to arrive at invention and original thinking. 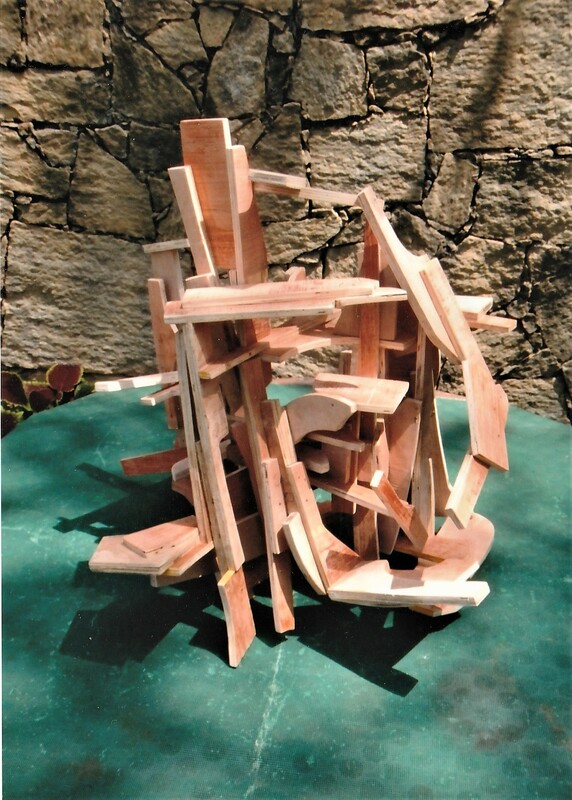 One such is the meaning and purpose of sculptural space in past sculpture. This has mostly been a matter of displacement by the physical elements of the sculpture, and/or what remains from the occupation of space by those physical elements. Unlike painting, which has always had to deal with a non-literal space created by the design of the graphic elements of the work; not so with sculpture. Even the ‘drawing in space’ initiated by Picasso/Gonzalez, and frequently emulated subsequently, only reproduces what is the standard aesthetic projection of line on a flat surface and only varies spatially according to the viewing position of the piece in question. 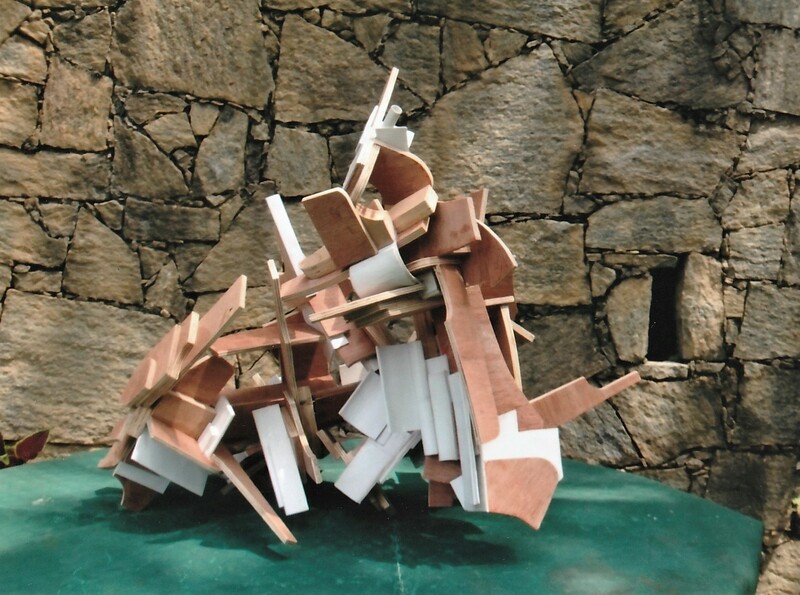 Another standard response has been the adoption into sculpture of an ‘architectural’ space which is, in essence, environmental; the physical elements of the sculpture perform as if they were some sort of shelter or enclosure, without that actual function. This, in particular, has often led to the confusion of sculptural intent with the object world, manufactured or otherwise, but it at least had the merit of attempting a ‘spatial’ quality in sculpture. 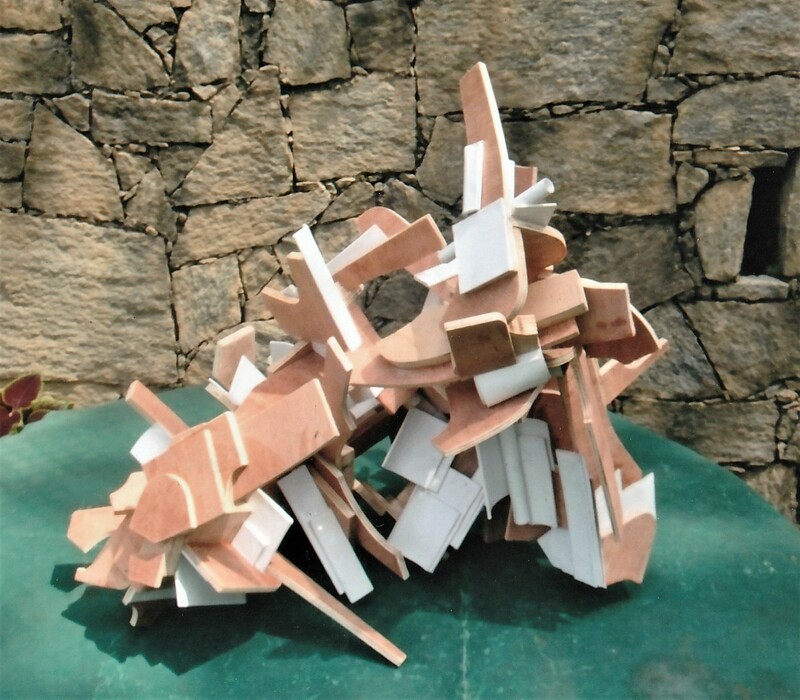 What is being looked for, then, is a sculpture space that is active in its role within the piece; active ‘physically’ even though it is non-physical. 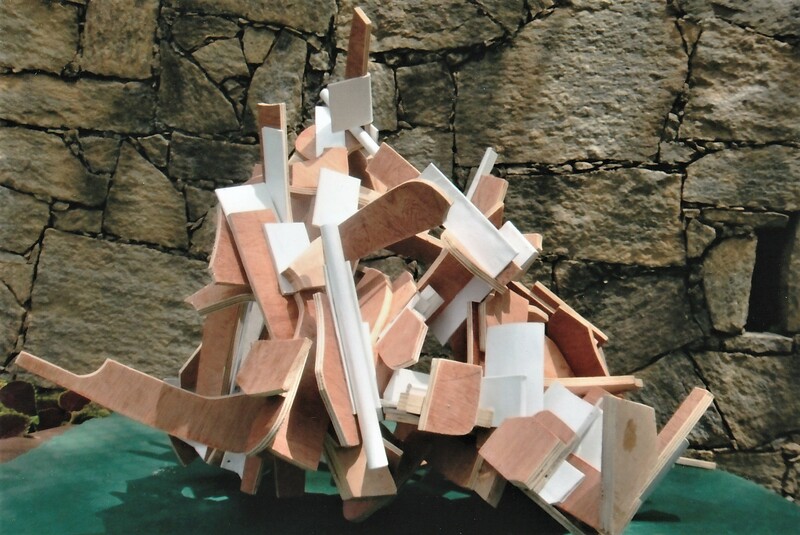 Despite the inevitable dominance of the actual plastic forms of the sculpture visually, is it possible to arrive at a sculptural structure in which these elements defer to the space that they not only occupy, but are also ‘directed’ by, to the point where this space can be read as making a positive, if not equal, plastic visual contribution? 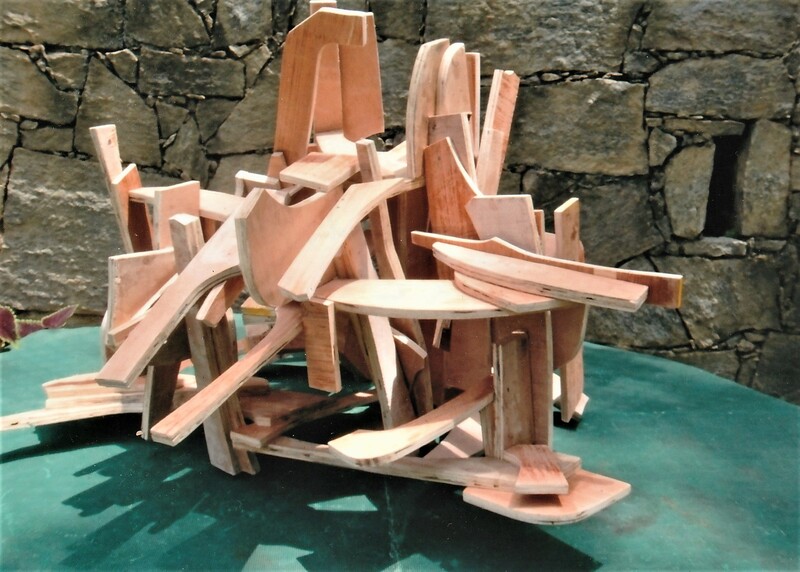 I would go further, and say even contribute to the structure of the piece as if they were essential to its ‘construction’ physically. 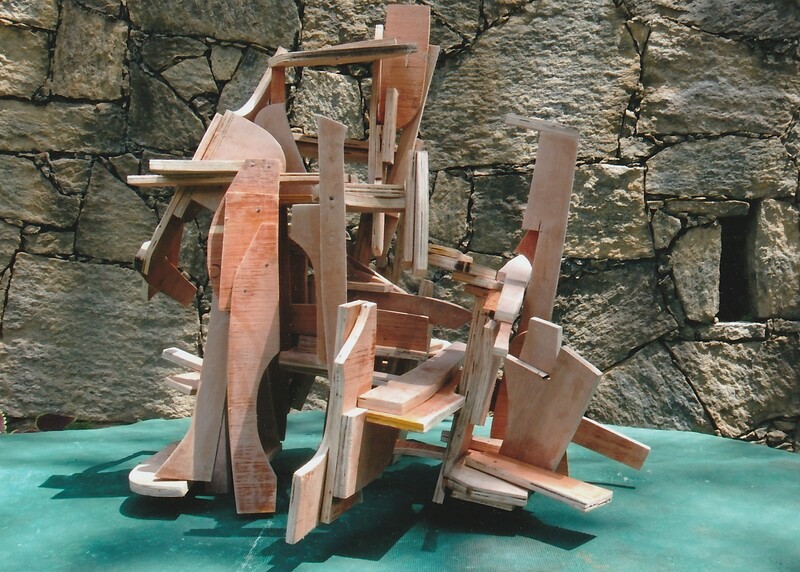 If this can be achieved in the new abstract sculpture of today, then the opening of the 21st century, like its predecessor the 20th, will set out for the art of sculpture a new dynamic and the seeds of new growth. The liquefaction of her clothes! – O how that glittering taketh me. 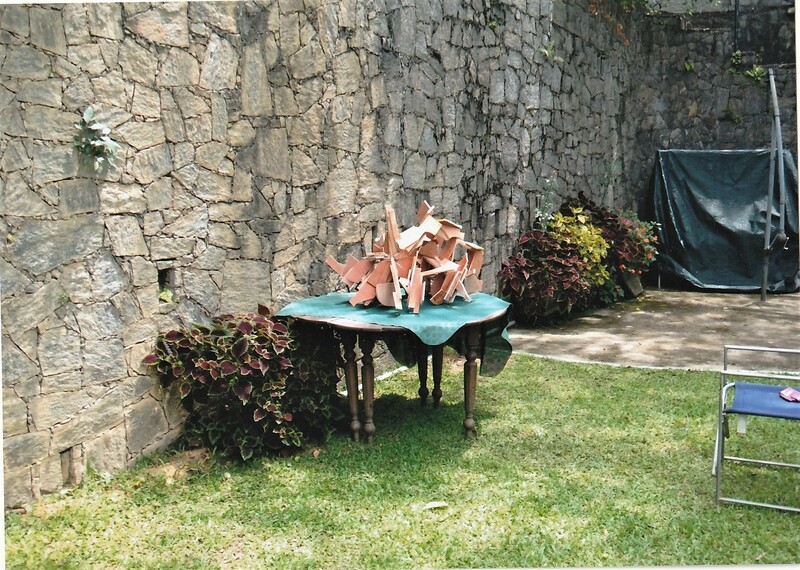 Tim sent me an unsolicited picture – see below – of a sculpture in his garden (with the beautiful stone wall) in Sri Lanka where he works six months of the year. I immediately asked for more. I’ve never seen these works beyond these photographs, and my guess is they may not easily get shown over here, things being as they are in the artworld. 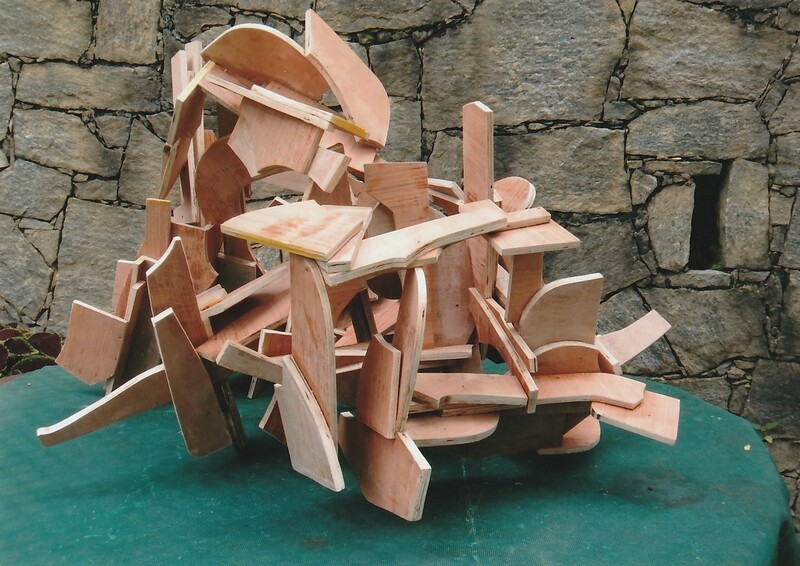 But from what I can see, and from what I can make as my best guess, it is not only Tim’s best work by far in plywood since he started showing in this medium at Poussin Gallery in 2011, but is his best work ever. I say that as a fan of some of his early work from the sixties and seventies, such as the “Bird in Arras VI” series that I wrote about in September in Abcrit, and someone who has appreciated much of his work in steel, both forged and constructed, especially the extended series made in Germany in the eighties and nineties. We can look forward to a book on Tim in the not too distant future, being written by Sam Cornish, examining all his work and history. Yet nevertheless, I think this work is outstanding, original and unprecedented, and I’m immensely taken with it. It has seemingly been made without the pretention that appears necessary to the inclusion of gratuitous novelty in new art, but they are nevertheless new. 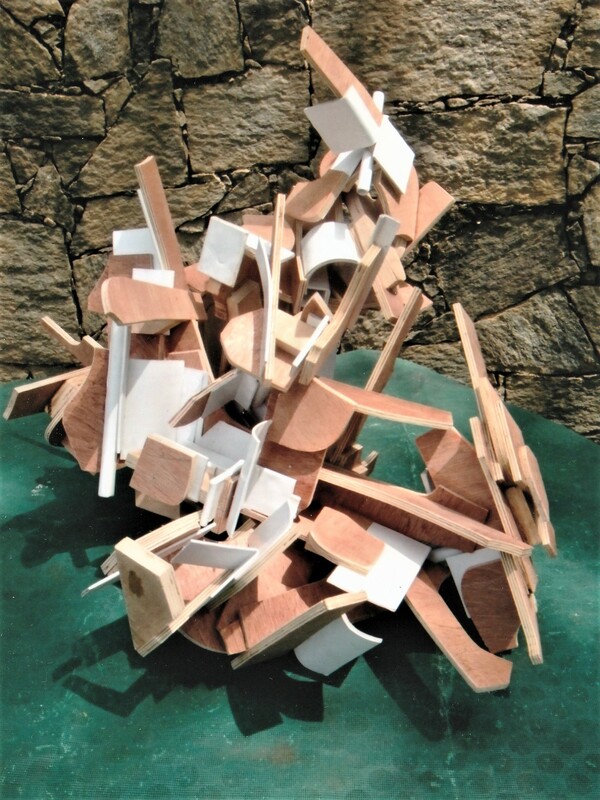 It is work full of a natural modest knowledge of what is complex and simple at one and the same time, standing as a reality of three-dimensional abstract structure that knows it has achieved plenty, and done so directly. 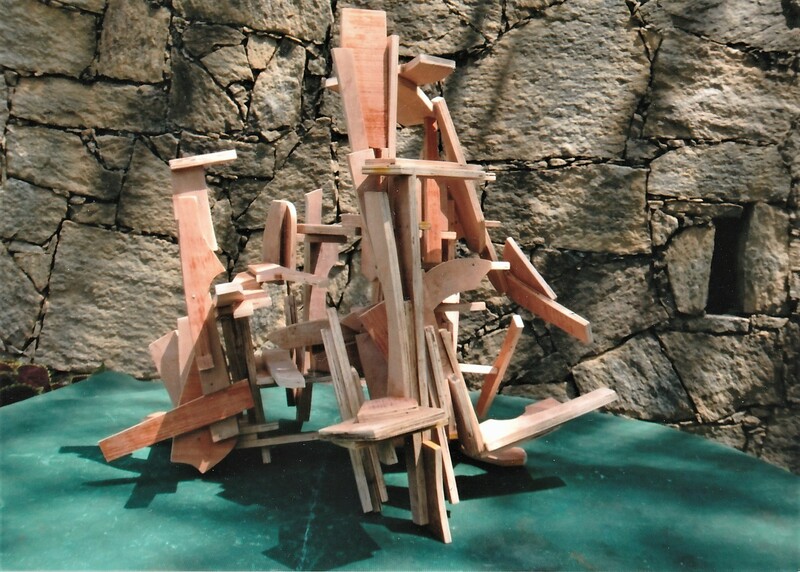 It can perhaps accept without strain certain kinds of limitations that are required in the most expressive sculptures – limitations which then allow unknown ideas to move as free systems of deep ambition. The second clause (“which attempt to emulate past values…”) begs the question of the nature of the ambition or commitment to emulating past values at all, given an environment in which, as you say, the institutional sources of the great art of the past (museums, galleries and collectors) are now ruled by the fashion market as you correctly point out. What is the value today of past sculptural values if, as seems undeniable, the only hierarchy of value acknowledged in our society is determined by dollars and cents? The first clause sort of suggests an answer, which is that there are (still) “outstanding unresolved areas” – sculptural “problems” for which no definitive “answers” have yet been found. My issue with this formulation is that it seems to be based on a model of scientific research, which proceeds by solving inherited problems. What happens if and when these outstanding unresolved areas are finally resolved? Does the art of sculpture just end, because it has, so to speak, achieved its mission? I think what is missing is the significance of personal values and commitments, which is really a philosophical rather than an aesthetic matter. My answer must be that it is only through those values that we KNOW what sculpture (art) IS. Every artist (or group of artists) throughout history has a sense of the value of what he / she / they are doing from their EXPERIENCE of the past. Most if not all, will have tråined their eyes and methods from attempting to emulate those values in their own period and efforts. As we know, our early modern masters constantly spoke of these efforts in their work. Unlike scientific answers in ‘research’, artistic ones are never finite; for they depend on human emotion which is constantly variable and changing in context. One of the challenges inherent for the ‘modern’ artist is the åtempt to inculcate ‘human’ values (as exemplified in past art) into present work; (one of the “unresolved areas” ?) Is this the same as what you call “personal values and commitments” ? The “aesthetic matter”is surely the method, not the content ? Robin – If only you were the Director of the Tate, or some such, how pleasant my working life would be !! Thank you, but perhaps your working life is already pleasant enough, at least in terms of the value of the work you make, regardless of a theory, or anything that could be offered practically? Surely the Tate know nothing other than hubris anyway. Liquefaction ii, amazing! So much movement and variety from such simple means, Fluid movement through space combining all the direct disciplines, constructed, modeled and carved. I do think that now that we have seen three years development of Tim’s work here of photos on Abcrit – of the card laminations of “Bridge of Echoes” in 2016 and the plywood “Song for Echoes” of 2017, and now these new ones – that these are outstanding developments that have gone beyond what I occasionally saw as exciting but slightly problematic – like for example the rather architectural look I flagged up in the way the “Songs” arranged themselves in vertical/horizontal arrays that stressed a little the “orthogonal” thinking. These new ones have not shed this approach completely, so much as totally embraced it as ways to work alongside many other incorporations of the varied structures. It’s looking more excellent as we keep looking. 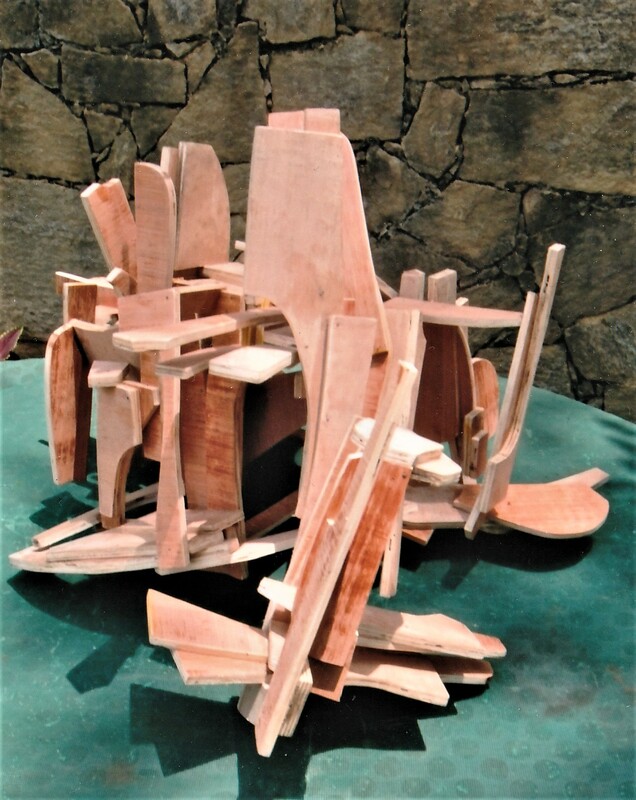 Robin – “…orthogonal thinking…” Yes, I am acutely aware that the cutting out of parts in this material tends to impose an angular and indeed rectangular schema on the parts themselves and the building of a whole from them. I have tried to limit the ‘shaping’ and development of part to part to a format that would read as a) direction, and b) movement; as of primary necessity and importance; and more, that they would feel IMPLIED by the space they occupy and traverse, and thus avoid any idea of them reading as an an ‘image’. Unfortunately the nature of the material as basically a flat plane imposes a limited choice of alteration, (unlike forging for example, which gave me much more freedom in the steel sculptures). All of which brings us once again to the dictatorship of material in sculpture and the battle to overcome it. I no longer think that the material, or its orthogonal tendencies, as I saw it and implied it a year ago, is the problem, because I now see it as true that you are beyond that. I would repeat my original comment to your essay – that certain… let’s call them “limitations” (to images? )… things that can even now go too far in certain ways that previously might have seemed worthwhile sculptural “innovations”… can now be accepted more positively in their own natural aspects, so long as they are not repetitive or formulaic, to be allowed “to move as free systems of deep ambition”. 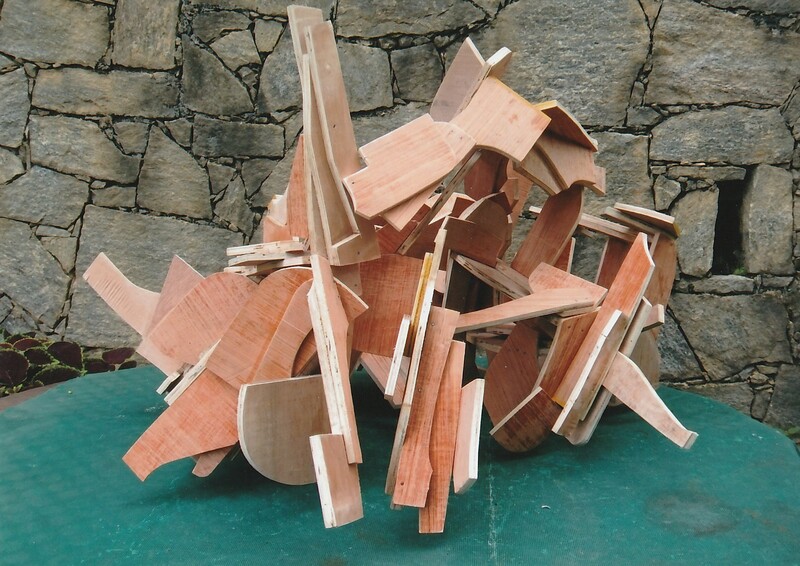 Let’s agree that the material itself – the plywood, in this case – is no longer an issue or even a “limitation”, but now is a question of how far one can variably invent with it to make more certain of its arrival at whole-form three-dimensional movement-structures. Then, I see no “flatness” to plywood (or to steel, for that matter). I’m now trusting fully to the idea that plywood and steel are already being made to provide more freedom than in previous “ideas” related to forging. Why ‘Unfortunately’? The material restrictions have made for something really special, of its material, the best expression of its possibilities. You talk of old age, this is the expression of a lifetimes experience, mano a mano with the material using all means at your disposal. Saul – Thank you for your appreciation and ticking off of my anxieties about material ! You are right, in the end a material is a material is a material, to rephrase the old Stein adage; and as Robin says above, getting “beyond it” is what counts. I think that having to drop working in steel was a big wrench for me and it took me a while to adjust; yes, hopefully something of all those years went into the present efforts. As long as age doesn’t wither me, I’m OK I hope ! Robin – I agree with what you say. The ‘flatness’ is literal, but the first order of the day is to defeat literalness of course. Forging did allow me, at any rate, to see a way out for steel’s (at that time) ‘givenness’; but I am sure that it would have different demands now were I to be still using it. 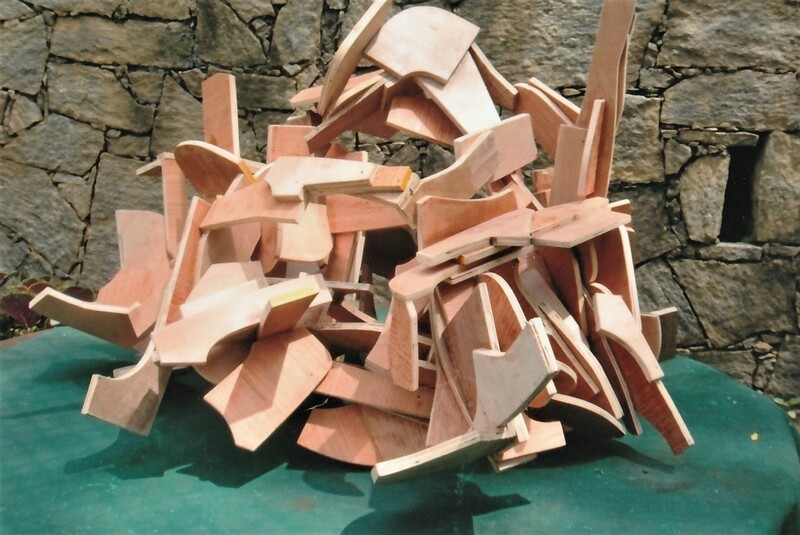 Is there something in the “matter of factness” that the decision-making in plywood has when used in this way compared to forging which could, due to its relatively longer process of forming, feel more overtly (pre)configured and perhaps too laden with a degree of taste by comparison ? I’m stressing “could” of course. 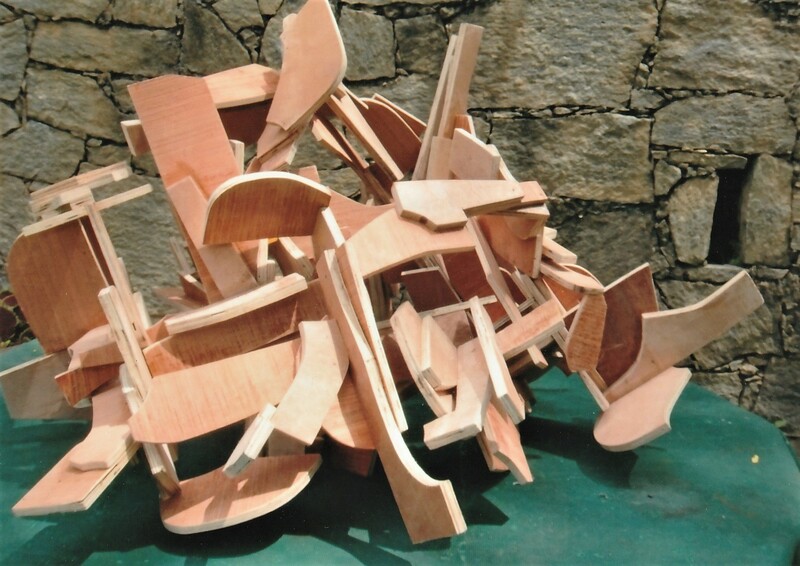 It seems that the simplicity of a cut – curved, straight – rather forces a certain directness; the limitations of the wood and its overt planarity (more effective in sculpture than painting?) become liberating whereas steel when forged seems to rely on a lot more complex knowledge, experience and handling skills. 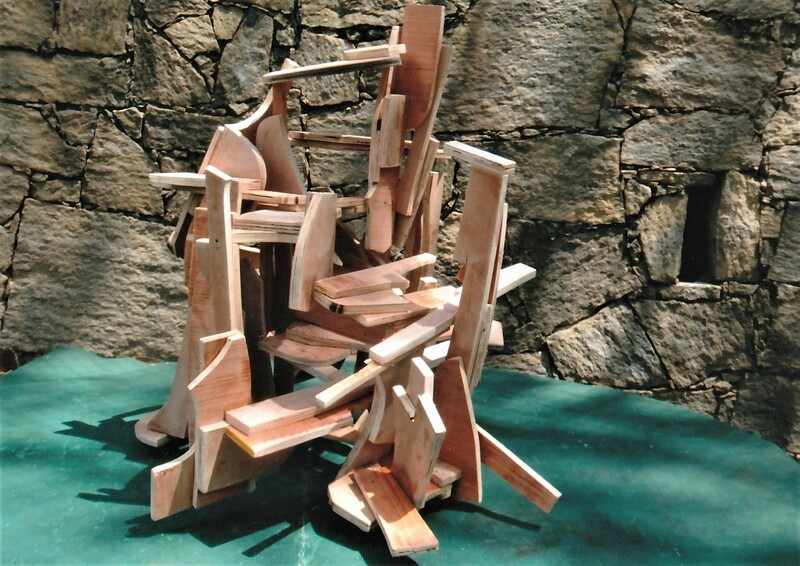 Offering a piece of wood to another seems so rudimentary by comparison – the result of which is being turned on its head here with the richness of expression in the outcome. The way out with forging from the “givenness” of pre-manufactured steel sections did seem really exciting in the seventies, but things always move on! 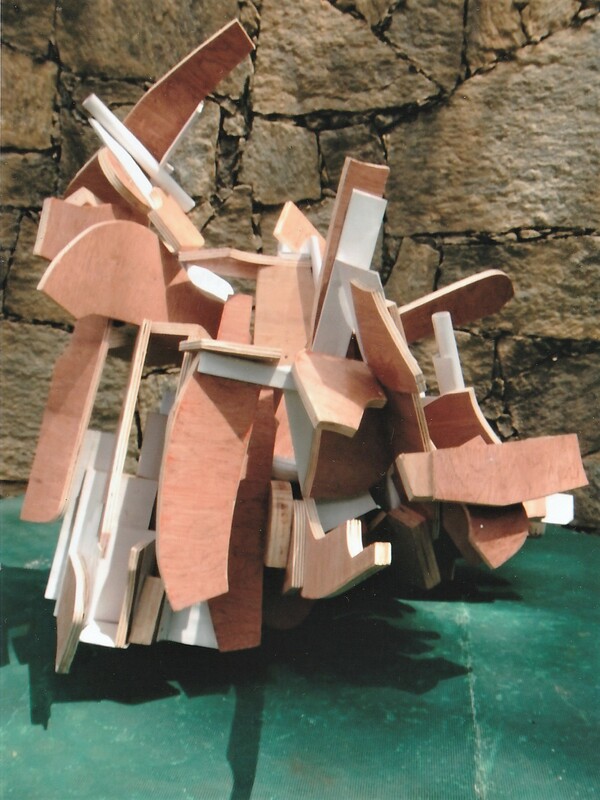 As we once agreed on Abstractcritical, sculpture always in the end “calls the shots”, not the material. Having once shed the stock-steel solutions of the sixties to favour much more plastic and spatial uses of transformative forging in the seventies and eighties, which seemed so deliciously enticing and full, especially when “paired” to structures of “the body”; so now we must ask yet more questions of the nature of REAL abstract sculpture again, NOT the “analogies to structures” that passed for other things. We now more firmly leave behind the appearances which we thought must pass for the equivalences to expressive sculptures that stood themselves up in the world like things we knew about. Those ideas look figurative and object-like, oddly and awkwardly limited to the pre-concepts that were so hard to think beyond; and which even now continue to disappoint in the work of those few still pursuing forging methods. I see no reason at all to regret your move out of forging, Tim, when things now look so good. In a way, therefore, I agree with Emyr – it is the forging that now looks rudimentary, because of association. The plywood – or indeed some of the new steelwork being done too – is far better off in a free approach. Materials matter to a sculpture but I think that with any successful sculpture the materials will, in a sense, disappear, as the object unconceals itself to the viewer. The photos indicate that Tim’s work embodies dynamic multidimensional (and multidirectional) structures where both space and material are dynamicaly attuned to each other. They look really good, although photos will flatten some spacial relationships, while emphasising others. There are moments in the photographs of these new pieces when all of that can be felt, and that is great. There are other moments, views which make for that to happen very difficult because of structure. Looking back at the three series is an occasional compressive, planar,opening and closing like a squeezebox.This,when I see it, is at odds with the best of the works, which I love. 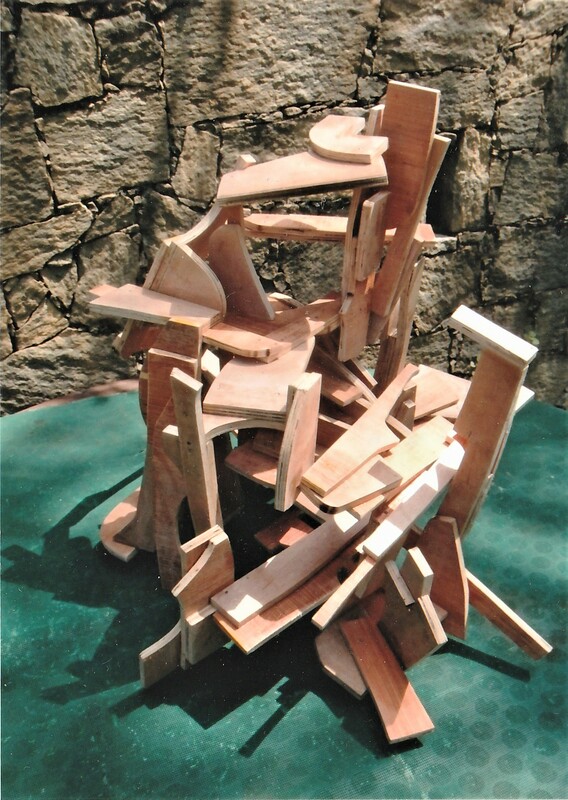 The weird thing is I do it myself and in fact its foundations lie at the very core of Abstract sculpture. It is as if the remnants of planar thinking are the memory against which a desire for free material and space in a new kind of three dimensionality is constantly being invaded.My question is …..
Is this totally a three dimensional issue which obviously embraces the space and where the stuff is all at one and the same time ? Is this not therefore a three dimensional issue and a three dimensionality that embraces space and material with intent. We are all trying to get rid of the object but it is our total dependance on objects from everything we use to the one we live in that forms the background against which our experiments take place. If you can’t have the memory of the object , what is being fought for in these sculptures here and elsewhere is the creation of a new believable ‘reality’. 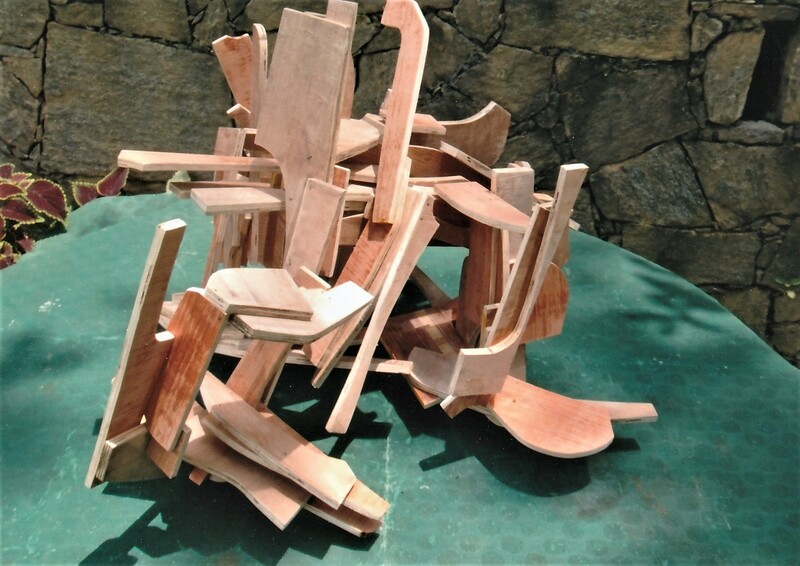 Yes, I agree that , compared to the forging process, the ‘directness’ is an asset. 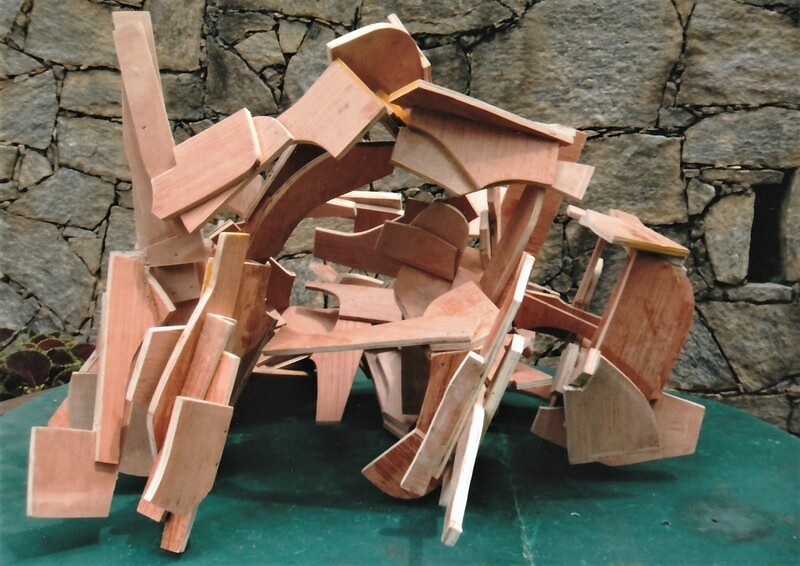 I hope that this positive aspect of the pieces sufficiently justifies its use; though no material in itself should justify the sculpture as has been said. Robin – Yes, of course everything is of its time, as no doubt these sculptures will be seen as in due course. 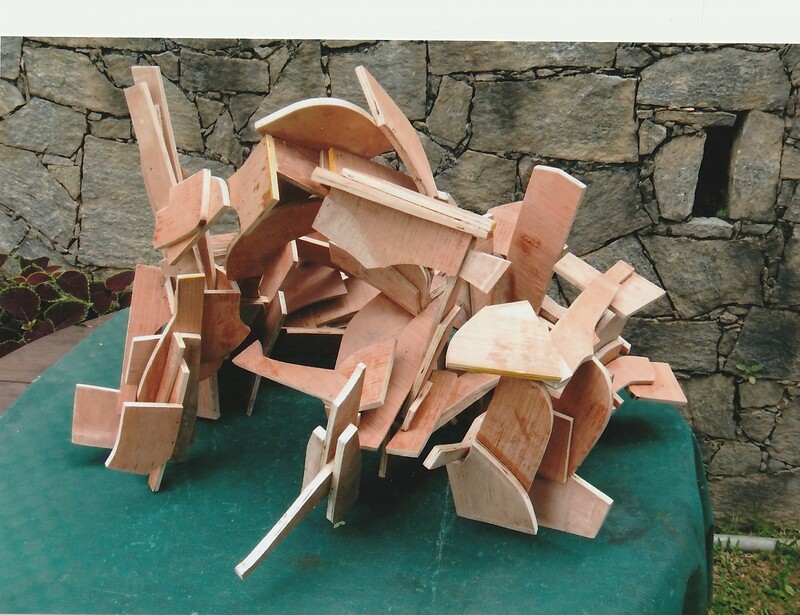 My only answer for defining ‘real’ abstract sculpture is that it should ultimately sit there looking not quite like anything else that one can think of, despite familiarity with elements or processes. We should be aiming for the sort of aesthetic satisfaction that no other object / thing / body has or can give (in quite the same way) and which therefore justifies its creation and existence. The other factor, in my view, which justifies its existence is, of course, it demonstrating clearly a genuine attempt to emulate something of the achievements of the past, if only in a miniscule way. Having embarked on my present course, I intend to persue it for better or worse, but of course cannot guarantee that will get anywhere else. 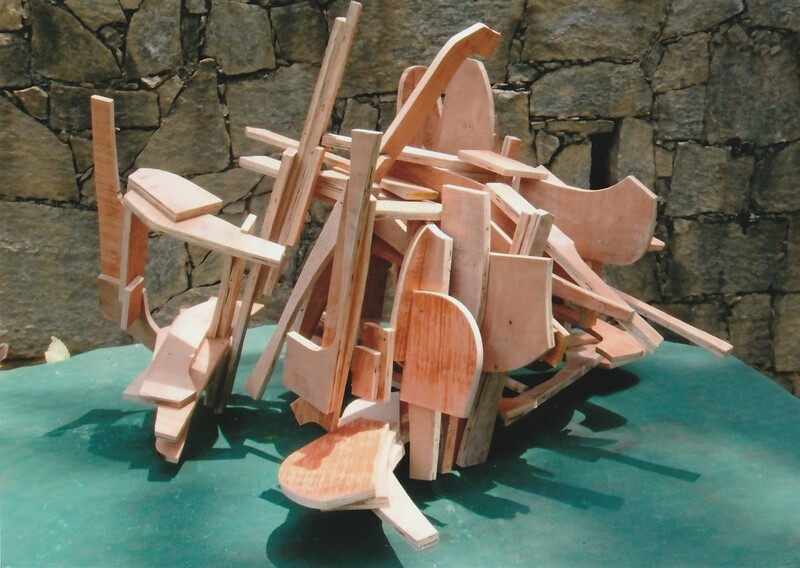 John – I totally agree that “…in any successful sculpture the materials will, in a sense, disappear…” Materials are the ‘instruments’ of the music of sculpture and when successfully and ambitiously played will evaporate as objects and become pure sound. As far as spatial relationships are concerned, I hope that upon experiencing the real things in the flesh, the viewer will ‘enter’ into these in a way that is totally thwarted by photographs which turn everything into a ‘graphic’ image unfortunately. Tony – ‘Planar thinking’ is indeed a background interference which has to be got rid of. New thinking, fresh thinking, is never really ‘new’ but imports and incorporates all sorts of cloudiness into one’s intentions, which are usually way in advance of practice. Space is by definition three dimensional (or even four); so. yes, new plastic spatial structures involve new three dimensional thinking. Exactly what that thinking should be is the question for all making the attempt at realising it in sculpture. 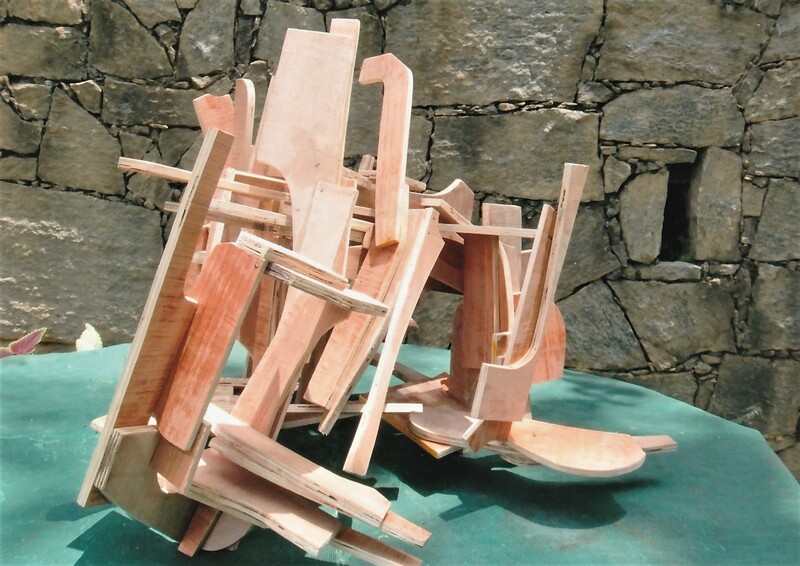 I previously said that a new (abstract) sculpture of today would lack patronage (museums, galleries, critics etc. ), and that the sculptors themselves would be marginalised for eschewing the current fashionable modes of what purports to be ‘sculpture’. It is very difficult, then, to suggest how ‘real’ sculpture would once again occupy the attention of the art loving public and attract promoters and suppliers. It is a fact that major museums and Galleries not only put ‘bums on seats’ by promoting fashionable trends and individual artists who have ‘made it’ commercially and promotionally, but also see themselves, particularly the big national institutions, as having a duty to continue to show ‘old’ ‘classic’ modern art in well promoted ‘blockbuster’ shows. I would have thought that it would not be impossible for these institutions especially, but also perhaps commercial ones, to realise alongside these promotions a programme of showing the works of current living painters and sculptors who profess to quite deliberately model their work on a contemporary continuum from the early ‘modern masters’ which, by definition, is a quite distinct area of thought to the populist fashion mongering of their contemporaries of different persuasion. This would be the antithesis of ‘post modernism’; but on the contrary be, ‘pro modernism’. It would conceivably challenge the assumption that ‘new’ art has to be cast in the mould of a Duchampian line of thought (which, ironically, is itself a hundred years old ! ). It would, in effect, be a ‘salon des Independents’ created not despite the official institutions, but by them as an alternative pleasure for the viewing public, many of whom have sorely missed the demise of the old museum policy of showing their collections of ‘master’ works more or less permanently. Ideally, of course, this would happen anyway, just as it did in late nineteenth century Paris; but times are changed and there is no possibility of such a collaborative organisation in this age of multiple individual artist and national (particularly) promotion. This latter is of particular significance today in that the ‘globalisation’ of culture has spawned an ultra nationalist view of modern art’s ‘development’ in every country. Nevertheless, the art of the 21st century must go somewhere; and we cannot keep on repeating the tired old formulae of ‘anything can be art’ etc., etc., which has become the norm. An effort has to be made to re establish the original axiom of ‘modern art’, its raison d’etre – to create a fresh and new vision of the world which is of now, of the present, whilst at the same time seeking, even if only in a putative fashion, to emulate, at least in some small way, the immense quality of ‘old’ art. This, the professed ‘new’ art of our time, that which constantly boasts of being ‘what is avantgarde, and being promoted as such, has singularly failed to do; its addiction to banality has seen to that. If we are to have a 21st century visual culture at all, that addiction will have to be challenged. For its so called ’embodiment of our time today’ is superficial and ephemeral, and above all, superceded in power of expression by today’s other flourishing visual media, rendering it spineless. The rather pathetic attempts by many of today’s artists to overcome this by absorbing other media (if you can’t lick ’em, join ’em) into conventional painting and sculpture formats in order to be ‘with itl’ epitomises this spinelessness. It is this spinelessness which is the biggest worry. The endless reiteration of the same tired old formulae; the clumsy exaggerated claims of originality and meaningfulness; and ], of course, its pandering to the lowest common denominator of the commercial promotional market, all render it unworthy of being cast as the representative visual culture of our time. experts – genuine ‘freshness’ being constantly subverted, largely, by false values; false humanism; false engagement with physicality, material,and structure; false claiming of emotional equivalents in crudely constructed ‘artworks’ containing false claims for understanding the zeitgeist of ‘now’. If ‘now’ is to be remembered for its visual art, something which should be of major concern to all engaged in the business of national culture and prestige, there will have to be a concerted effort to broaden the scope of what passes for originality, fresh thinking and renewed invention in what for better or for worse is known as Fine Art.